I’ve filmed another Journal Friday — this time adding to pages from last week using water-soluble pencil. I wanted to do Journal Friday a bit differently today, so I made a video. It’s just a short video trying to figure some things out. I’m hoping to make longer videos in the future, but I’ve got to start somewhere. Hope you enjoy seeing some journaling in action. My Creative Journey is now available! 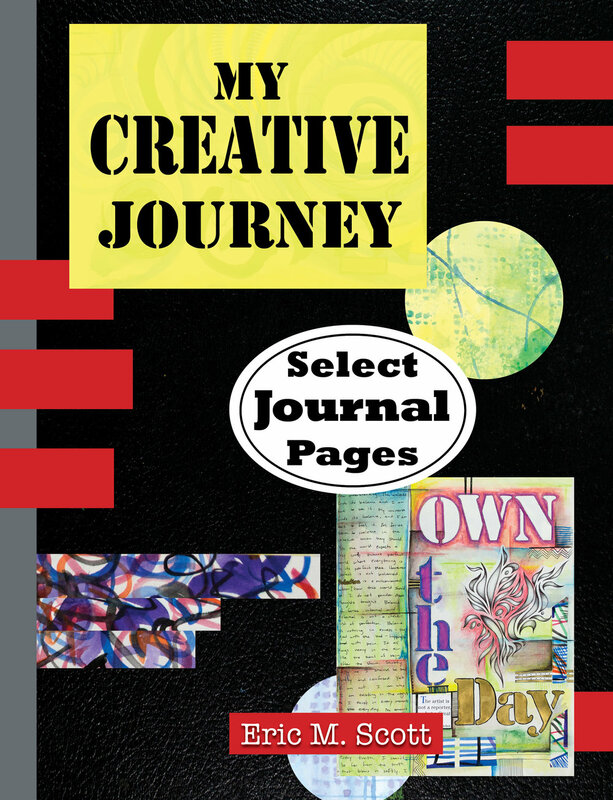 I can’t believe that my new book My Creative Journey has been published! It seems like I just started working on it, and it was just a week ago that I was announcing that it was finished when I shared a look at the cover. It’s amazing how different self-publishing is to traditional publishing. When David and I published our first book, The Journal Junkies Workshop, it took about two years to go from acceptance to publication. With My Creative Journey, I mulled over the idea of self publishing for a couple of years, but I’ve only worked on the book for the past two months. In early August, I began photographing and editing pages from my journals figuring out things as I went along. I’m computer savvy, but I am by no means a wiz with Photoshop or InDesign, and there were a lot of challenges. But I plodded along putting in hours and hours of work to get the book together. I wrapped everything up a week ago, and uploaded it to Kindle Direct Publishing, and ordered a proof. I don’t sound very excited in the video that I recorder this past Monday, but I really was. The book looks gorgeous, and it is truly how I imagined it. The quality is awesome - from the paper to the printing, and I’m even more excited now that I got notification on Tuesday that the book was live on Amazon.com. I mean, wow! Wow! WOW! Just like that, the book is out there and people are ordering it. I’ve ordered a bunch to be able to sell in person, and I can’t wait to get them. But it somehow feels a bit surreal, like did I just really do that - put together a book and publish it in two months? And, YES! Yes I did, and I can’t wait to hear what people think of it! If you get a copy, please let me know what you think, and please leave a review on Amazon. Oder your copy today! And of course, I appreciate any help in spreading the word! So, please share, post, and give shout outs where you can. As always, Thank you for all of the support! As I work to put together my book of journal pages, I am struck by a few things. First, I’m struck by the amount of white in the earlier journals. The early journals contain a lot of pages that feel empty and unresolved. Even the more resolved pages have a lot white. Second, I’m struck by the amount of photos and image transfers in these early journals. I had access to a color laser printer, and I printed a lot of my own photos, especially of myself. I used a lot of these print outs as collage materials for the pages and as image transfers. Finally, I’m struck by the shallow layers. Though there’s some layering in the pages, they’re not as richly layered as my later pages. It took me quite some time to develop the techniques for layering that are a hallmark of my journals now. It’s always nice to take a trip down memory lane with these early journals. Here are some pages that probably won’t be in the book. I have mentioned before that the visual journal process for me is not a linear process. I don’t complete a page or spread and then move to the next. I add bits and pieces completing little actions that accumulate in the journal and allow pages to develop slowly. Some pages stall, and I come back to them months later and add to them. Revisiting pages time and time again allows me to reflect on them, mulling over the possibilities. Underdeveloped pages often catch my eye, but I often pass them by until finally an idea strikes and I add to them. Such was the case this week, as I turned to two simple artistic acts using two of my favorite materials to add layers to pages — some of which were started months ago. I love water-soluble pencil, and Derwent Inktense pencils are some of my favorite. These pencils contain a water-soluble ink that is bright, and most importantly, transparent. I love building layers with them. So I flipped through my pages and found some underdeveloped spots to add color and layers. I simply used water to spread pigment — a technique that I probably use 95% of the time. I also turned to colored pencil to develop one of my two-page spreads as well. I’ve been using Faber-Castell Polychromos a lot recently in some stand alone works, so I decided to use them on the spread at the top of the post. 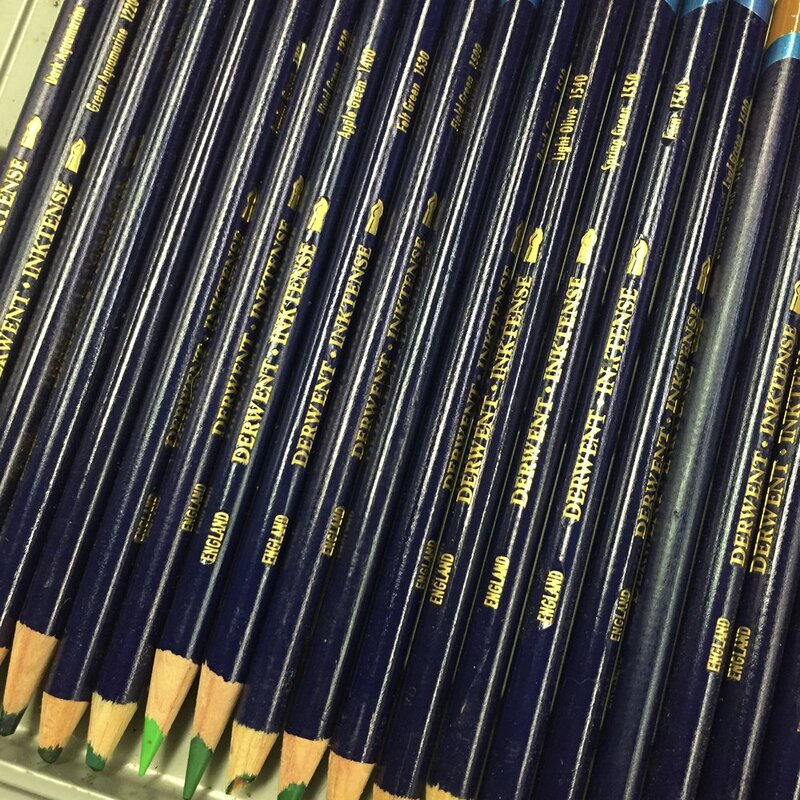 These pencils are smooth and rich, and they are ideal for working in on top of the Inktense. They allow for a more finished and polished look, and they’re great for fine tuning color and edges. I find that I can get a lot of depth with them. So, this week has just been about returning to some favorite materials and some simple artistic acts to go back to pages that were begun months ago. I love when these stagnant pages can find new direction and momentum. I've been keeping myself busy with a number of projects, and I haven't had a lot of time to work extensively in my journal. But I've had some opportunities to add some doodles and embellishments. I'm a big believer in little actions leading to big results, so as artists we don't need copious amounts of uninterrupted time in a studio with access to all of our paints, markers, stencils, and materials. Often all we need is an ink pen and a few minutes. This week, I was able to embellish some text, add some spirals on the Legacy spread, and add to some ink doodles on other pages. These little actions add a lot of richness and depth to pages. It wasn't a whole lot but, these little actions will add up. I've worked a little in the Journal this week, but my energies have been focused on other projects. First, I'm working to finish the last installment of my ebook series, The Journal Fodder Junkies Daily Challenge. I'm a couple of months behind with releasing this installment, but I've been working on it, and hope to have it available soon. Second, I've been working on another project - one that I've been wanting to do for quite some time, and I'm hoping to have it wrapped up in early October. So, I want to officially announce that I am working on a book of Journal Pages. After the release of our two books, The Journal Junkies Workshop and Journal Fodder 365, David and I wanted to publish a book of just journal pages like the Dan Eldon book, The Journey is the Destination. But after approaching a few publishers, including North Light who published our other books, we were turned down. But now with the easy of self-publishing, I am putting together select pages form my first ten volumes of journals. This will be a solo project, but hopefully we can follow up with a book of David's journals soon. The book will be a similar format as the other books - 8.5x11 inches with around 144 pages, and I'm looking to publish it through Amazon's Createspace. Since it will be self-published, I have to do all of the work. I've been spending a lot of time photographing, editing, and curating journal pages. 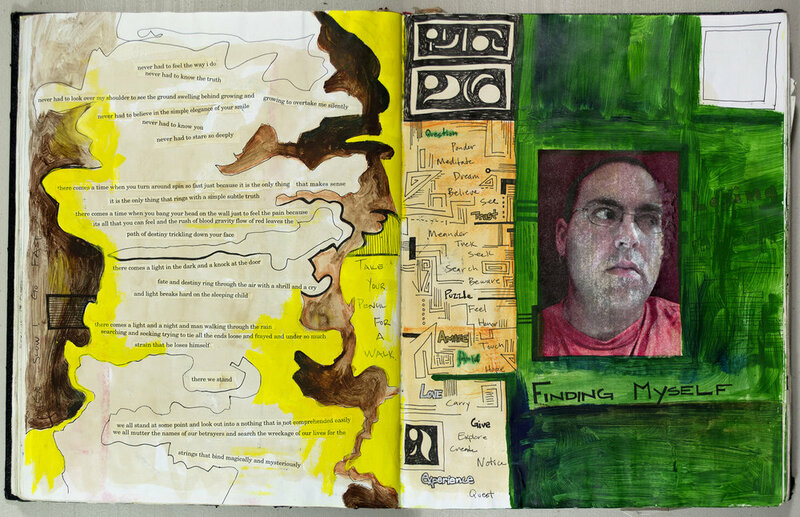 I've been looking for two-page spreads that can be used so that when the viewer looks through the pages, they'll get an experience that is more like looking at the actual journals where side-by-side pages aren't cobbled together from different sources. It's a lot of work, but I'm hoping to have it ready by mid October. Wish me luck! In the mean time, I thought that I'd share a few pages and spreads that I probably won't be using. It has been a very sad week in our house, as we have lost two members of our furry family. Early in this past week we said goodbye to Neville (pictured above). He was the newest member of the family, and Joanne rescued him on a trip to New Mexico. She had gone to help Soul Dog Rescue with a clinic in Crownpoint, New Mexico, and this poor, paralyzed little kitten was brought in. Joanne fell in love immediately, and brought him home as a "foster" with the goal of trying to get him healthy. Neville was a very sweet and social little kitten, but he was extremely underweight and had extensive medical issues. At first, things looked up. He gained weight, and he seemed to be getting stronger. Unfortunately, after a little more than two weeks, he took a turn, and we had to say good bye. His life was short, but we were able to offer him love and comfort for two weeks that he wouldn't have had otherwise. We also said good bye to the matriarch and oldest member of our furry family. Pop (above) was 18, and was born to Joanne's very first foster cat when she lived in Georgia. The litter was named after Rice Krispies, and there was Snap and Crackle along with Pop. Joanne adopted Pop as the others found homes elsewhere, and Poppy lived her entire life in a loving home. A while back, Pop had developed kidney issues, but had bounced back quite well. She seemed like she was doing well, so we were caught off guard when we took her into Joanne's clinic for her annual check up and had to be put on IV fluids. She went downhill very quickly, and we made the decision to say goodbye. We are very sad, and the house seems much emptier. But we are very grateful for the doctors and the staff at Leesburg Veterinary Hospital for their compassion and all of their help. We will miss our little furry family members!